According to the US. Department of Energy, heating and cooling accounts for 48 percent of residential energy usage, making it the largest expense in most homes. Air conditioning accounts for 6 percent of the total electricity generated in the U.S., contributing roughly 117 million metric tons of carbon dioxide to the atmosphere. Cool air is truly essential in many cases, such as food refrigeration, healthy environments for children and the elderly or in datacenters. Radiative sky cooling is a method of transferring heat with little to no power cost. The earth’s surface constantly radiates heat into space, simply due to the second law of thermodynamics. However, this radiant heat is blocked by clouds and particulates, and during the day the heat input by the sun far exceeds the heat released to space. On a cloudless night, the cooling effect of radiant heat is greatest, because these obstacles are out of the way. However, if radiant sky cooling is to be useful, it needs to be effective during the day, too. 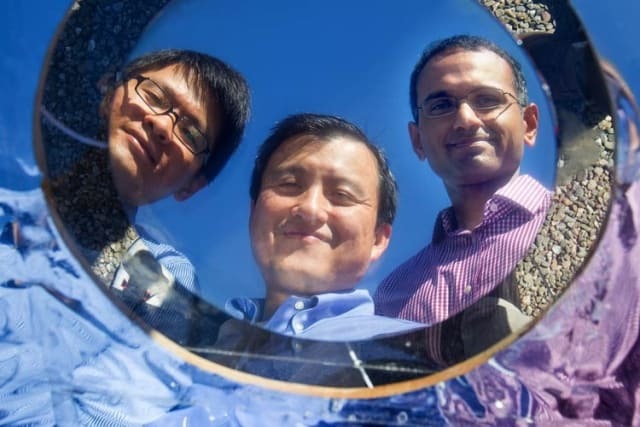 Since 2013, a professor of electrical engineering at Stanford University, Shanhui Fan, and his team have been working on a mirror-like optical coating that lets radiant heat out, but not in. In 2014, the team published research proving that their multilayer silicon dioxide and hafnium oxide material can cool itself. Now, the team has proven that a system of panels can cool flowing water to a temperature lower than the surrounding air. "It's very intriguing to think about the universe as such an immense resource for cooling and all the many interesting, creative ideas that one could come up with to take advantage of this," Fan said. 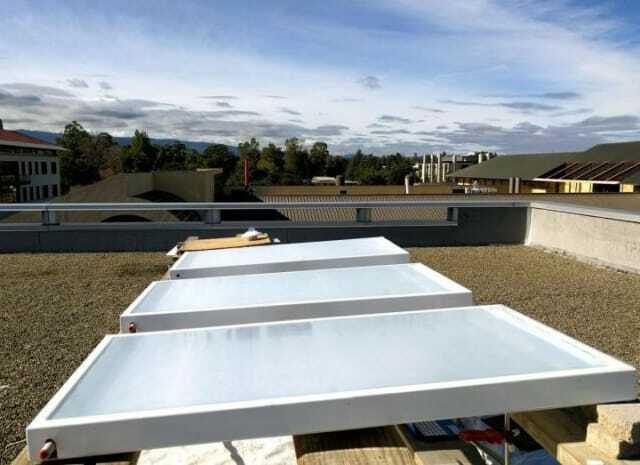 The researchers built a system where panels covered in the specialized optical surfaces sat atop pipes of running water, and ran tests on the roof of the David Packard Electrical Engineering Building at Stanford’s California campus in September 2015. These panels were just over two feet in length on each side, and the team ran as many as four panels at a time. With the water moving at a relatively fast rate, they found the panels were able to consistently reduce the temperature of the water three to five degrees Celsius below the ambient air temperature over a period of three days. "This research builds on our previous work with radiative sky cooling, but takes it to the next level. It provides for the first time a high-fidelity technology demonstration of how you can use radiative sky cooling to passively cool a fluid and, in doing so, connect it with cooling systems to save electricity," said Aaswath Raman, one of Fan’s associates working on the project. Passively cooling water with little to no input electricity could have big implications for the U.S. power grid. In a computer simulation of this system operating on the roof of a two-story office building in Las Vegas, where the hot, dry conditions are ideal for this technology, the panel-cooled system saved 14.3 megawatt-hours of electricity, a 21 percent reduction in the electricity used to cool the building. In the simulation, the special optical panels covered the roof, with the chilled water cooling a vapor-compression system. Over the entire period, the daily electricity savings fluctuated from 18 percent to 50 percent. Fan and his associates, Eli Goldstein and Aaswath Raman, have founded the company SkyCool Systems, under which they are further testing and commercializing their technology. Next steps for SkyCool include making their panels integrate easily with standard air conditioning and refrigeration systems. Fan and his team are particularly excited at the prospect of applying their technology to the serious task of cooling data centers. Improving the efficiency of datacenters is a major goal for companies like Facebook, Google and HP. Hit the links to learn more about power-saving engineering at these companies.